The first few weeks SARAH & KATY AND THE IMAGINATION BLANKETS was listed on Goodreads, I checked the website obsessively multiple times per day. A book can be either brilliantly crafted or horribly written, but its success doesn’t lie in its quality. It lies in how readers receive it. 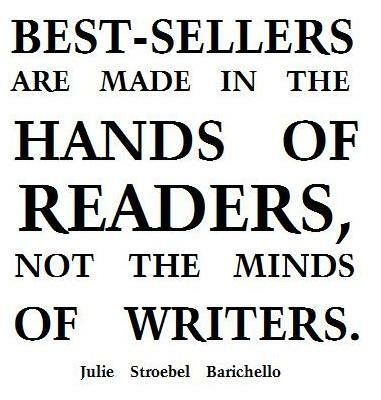 Best-sellers are made in the hands of readers, not the minds of writers. Every writer goes through this at one point or another. The question, “Is it good enough?” leaves us paralyzed as we await the first judgment. The first reader feedback was a star rating — Goodreads allows users to rate books from 1 to 5 stars. The first I received was a 5-star rating, which left me overjoyed (especially because the rating came from a stranger, not family or friends). The second rating was 3 stars. My heart plummeted into my stomach. Three means average. It means someone liked the book but didn’t love it. It means I’m a failure as a writer and might as well hang up my writing cap. Then I kicked myself out of the melodrama, took a deep breath, and approached the rating rationally. The majority of books I read in 2014 were books I enjoyed, and I gave them 3-star ratings. They were good books. None of them made my favorite list, though. OK, I told myself. I can deal with 3-star reviews. I can handle being a good book, even if I’m not a favorite. The following days were gentler on my delicate writer’s ego, with a couple of 4-star ratings as well as two more 5-star ratings. Then came the moment of truth: The first Goodreads reader review. I considered calling the husband at work and making him read it first, then tell me whether I should eagerly read it or spend the next few days bracing myself for harsh criticism. But I took a deep breath (then another), and opened the review. Julie Stroebel Barichello’s “Sarah & Katy and the Imagination Blankets” is a charming tale of two sisters who receive a couple of magical blankets for Christmas. The story is delightful and fun and the illustrations by Hannah Jones complement the story well and add to its charm. It’s easy to read and the banter between the two sisters, and the cast of characters they meet on their adventures, is relatable for young ones. I like the author’s choice for a quote at the beginning of the book as well. The concept of this book adds to its appeal, since many schools have eliminated music and art classes and young people’s playtime is usually spent on technological devices, there just doesn’t seem to be much in the way of encouraging them to use their imaginations any more. This book can do just that. I won this book from Goodreads.com in exchange for a review. I highly recommend this book as it is charming and has language appropriate for its intended audience (no complicated words, profanity, etc.). The constellation of other star ratings pale in comparison to that review. That is my shining star, my north star, the feedback I will forever remember as the first. It is my armor against negative reviews to come (because, inevitably, they will come). This is the review I will return to after reading the bad reviews, giving me the strength to go back and reread the bad reviews to sift for the nuggets of criticism and feedback that will strengthen future books. Even knowing I have Brandi’s review to strengthen me, though, I bet I still hold my breath through reading the next one. This entry was posted in Writing and tagged book review, books, Goodreads, reading, writing. Bookmark the permalink. January 11, 2015 at 9:57 p.01. Thanks, Trinity! The book can be ordered through Amazon and most major bookstores (including Barnes & Noble). Ok, that means I can probably get it at my library pretty soon! Yay! I’ll review it for you if and when it comes in.